Heather Nichols has another fantastic Monthly Moments collection coming your way, just in time for your October pages! It includes special touches for Halloween and other traditional fall activites. There is even a little soemthing that will coordinate with the previously released Just the Ticket border die! Birthday Classics: November is even more beautiful than the last! Not to mention more versatile too, with this fun little banner accent that can be added in a different color! 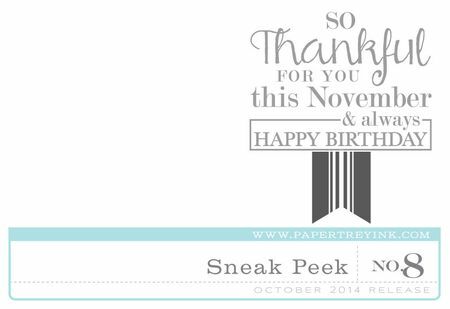 Dawn McVey has included some great fonts in this mini set that will be perfect for celebrating all of the November birthdays in your life! oh my how cute.. love that pumpkin.. loving all the sneak peeks.. I like the way the Happy Halloween is written on that stamp! Happy Halloween is written in such a unique way. Love the Happy Halloween and the November birthday is on my list, I have 6 November babies in my family and have to get this! Loved the NOVEMBER Birthday ! My favorite is November Birthday. All of your birthday month stamps are amazing. Great work DT! More great peeks! Love the way the first sentiment is designed, quite unique! Have enjoyed the birthday classics. I agree with others – very clever combination of Happy and Halloween, love it! Beautiful sneaks!! I love how the halloween sentiment is done can’t wait for more! I love that Happy Halloween sentiment!! Yay! Unique Happy Halloween – gotta have this one! November is a special time to have a birthday…especially when it occurs around Thanksgiving (our family has 5). Cute new tings this month! Love the Happy Halloween and the Pumpkin, so cute! I love the November collection! Stamps i sure can use. Love it!!!! Oh that is a perfect sentiment stamp for my daughter, she was born in November! Pretty great! How cool. My sister, grandson, granddaughter and I all celebrate our bdays in November. Love the Halloween combo. Both of today’s sneak peeks are cute. The Halloween sentiment is fantastic…love how the letters are laid out. What cute little riff on Happy Halloween! I have lots of November birthdays coming up in the family, this stamp will be great! Love them both! Being a Thanksgiving Birthday Girl every few years, I feel something personal about that one. And, like everyone else has said, fab Halloween stamp!!! The birthday classic is a nice one!! I love that Happy Halloween. Wow. So clever. The Happy Halloween saying is awesome. Love how it is written. What a great spin on the typical happy halloween sentiment. Once again excitement is brewing with cute halloween design ! So many great ideas to inspirer holiday fun…love it !,! Heather’s Halloween image is so clever! Love these sneak peaks can’t wait to be able to purchase these great new stamps and dies! Love love love the winter card & the unique happy Halloween stamp!